Today has been my first excursion back into C++ and MFC for years. I was trying out Michael’s application on my machine, but I could not get it to display its initial window. On Michael’s PC everything worked, of course. I first supposed that there could be some missing files, that explained why it worked on Michael’s and not on mine. This was quickly ruled out by trying the application on a clean VM. Clean Windows 8 machine? OK.
Clean Windows 7 machine? OK. The thread ‘Win32 Thread’ (0x12c8) has exited with code 0 (0x0). The program ‘ coursch2.exe: Native’ has exited with code 3 (0x3). Do you see that ENSURE right there? It will throw an exception and kill your process in no time if the program fails to load the string. Huh? It started to smell like some rotten localization issue. Apparently, we are not alone as this old post from 2009 proves. The symbol AFX_IDS_UNTITLED (which resolves to 61443 or 0xF003) could not be found on my machine, but on Michael’s it resolved to a valid string. Because I am working with an English UI and Michael is working with a French UI. And the program has only French resources. We did not find the reason of why it works on the French systems, but not on English ones. There must be some tricks played on us by evil Windows fall-back mechanisms which do (or do not) find resources in MFC. Even when it is statically linked, like it is in our case. Now, why did the program work on my clean VMs? At first, I supposed that they were also running a French version of Windows. But no, both proved to be English installations. Changing the Region and Language used by the system to a Format set to French (Switzerland) triggered the crash. 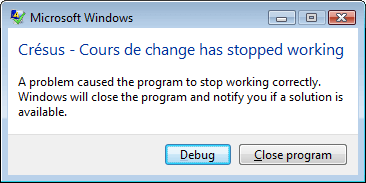 As soon as the English VMs started working with a locale set to French (Switzerland), the application consistently crashed on startup. And to make things more interesting, if I try another French locale, such as French (Canada), everything just works. Maybe nobugz Hans Passant has an explanation for this behavior. I’d be curious to know why the resolution of AFX_IDS_UNTITLED succeeds when the locale is not identical to the setting in the *.rc file.